When I taught at Bethlehem Catholic High School in the 1990s, there was a custom that each of the four classes could decorate a hallway for Catholic Schools Week. One year, the seniors, who had been reading Dante’s Divine Comedy in English class, hit upon a very creative idea. 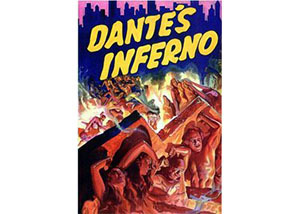 Those of you who are familiar with the Divine Comedy know that it is a very long poem in which Dante describes his journey through hell (Inferno), purgatory (Purgatorio), and heaven (Paradiso). The senior class decided that they would decorate one end of their assigned hall to look like hell. Was it a coincidence that their English teacher had her classroom at that end of the hallway? The middle section of the hall would be decorated to look like purgatory, and the far end of the hall would ultimately resemble heaven. The seniors began putting up their hellish decorations. There were depictions of little devils running around with pitchforks, faculty being boiled in caldrons of oil, and all manner of infernal torments inflicted on various members of the administration. For my part, I was not at all surprised or upset. The seniors had simply given visual expression to a truth we know all too well. Philosopher Simone Weil, in her 1952 book Gravity and Grace, said it best: “Imaginary evil is romantic and varied… Imaginary good is boring…” She’s right. Imaginary evil is romantic and exciting. That’s why it’s not all that difficult to make a gripping movie about sin and evil. Hollywood deals with images, and imaginary evil is exciting. That’s why, too, it’s a lot more challenging to make a really fine movie about goodness, virtue, and holiness. Imaginary goodness is boring. Again, real evil is boring. People are called strange for either of two reasons: They are withdrawn from others; or, compared with others, they are singular and superior in their deeds and works. The soul calls God “strange” for these two reasons. Not only is he all the strangeness of islands never seen before, but also his ways, counsels, and works are very strange and new and wonderful to humans. It is no wonder that God is strange to humans who have not seen him, since he is also strange to the holy angels and to the blessed. For the angels and the blessed are incapable of seeing him fully, nor will they ever be capable of doing so. Until the day of the Last Judgment they will see so many new things in him concerning his deep judgments and his works of mercy and justice that they will forever be receiving new surprises and marveling the more. Hence not only humans but also the angels can call him “strange islands.” Only to himself is he neither strange nor new. Well, how do you like that? The doctrine of the Trinity reminds us that God—Father, Son and Holy Spirit–is more than a simple idea or mental abstraction. He is a profound Mystery with fathomless depths of joy! Isn’t it great to be Catholic? Isn’t it great to profess belief in the Trinity? ABANDON ALL DESPAIR, YE WHO ENTER HERE!